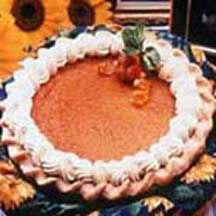 This delicious sweet potato pie recipe was prepared specifically for the North Carolina SweetPotato Commission by Marianne Langan. In a large bowl combine all ingredients and beat at medium speed until well blended. Spread evenly into unbaked pie shell. Bake in a preheated oven at 450°F (230°C) for 10 minutes. Reduce temperature to 350°F (175°C) and bake for 40 minutes longer or until set. Cool on wire rack. If desired, garnish with whipped cream, raspberries and mint leaves. Recipe and photgraph provided courtesy of North Carolina Sweetpotato Commission.